Portraits can be ordered in oil, pastel, watercolor, pencil (graphite) or charcoal. You can use the images on this website -and the close-ups below- to help you with your choice, but it’s also possible to view artwork in Marjoleins studio first (Amersfoort/the Netherlands). Marjolein has made over a thousand portraits, this site shows just a fragment. If you wish for more help with ordering a portrait, or to discuss all the options, feel free to call Marjolein or make an appointment to visit her studio. TIP: also read how does it work? And pricelist. Miniature portraits in commission size 11×11 cm in acrylics for only €130. Marjolein only works with the best professional paint- and drawing materials available, so your portrait will stay in an excellent state for many generations. Most of her oil paintings are painted on Masonite panels which she grounds herself. For large sizes portrait canvas is used. Other techniques are applied on paper surfaces, all acid free. Which means that the paper won’t yellow in time. 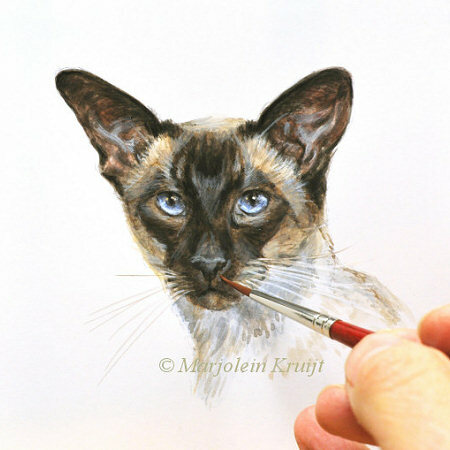 Marjolein uses only ‘lightproof ‘watercolor and pastel pigments. Additionally, it is best to frame portraits with a mat behind museum glass with UV filter. Portraits in oil don’t have to be framed that way, because a removable high quality varnish will be applied which also contains UV-filter. If you wish Marjolein can arrange a fitting frame for your ordered portrait.